Mike Pompeo attends for the first time summit between Netanyahu, Cyprus President and Greek Prime Minister. 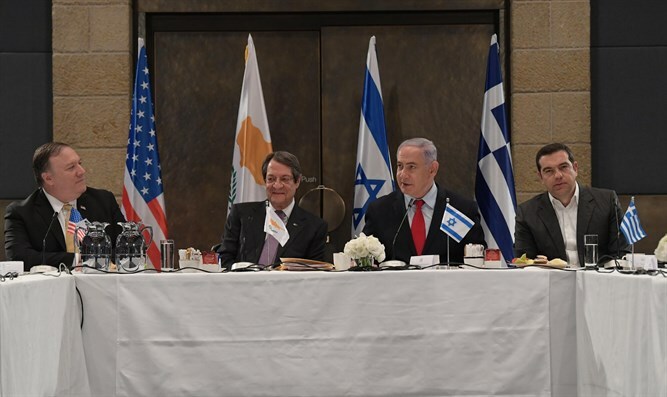 Prime Minister Binyamin Netanyahu on Wednesday evening hosted the sixth regional summit with Cyprus President Nicos Anastasiades and Greek Prime Minister Alexis Tsipras. For the first time, an American representative attended the joint meeting at the Citadel Hotel in Jerusalem - US Secretary of State Mike Pompeo. “We are planning to lay down a pipeline called the East Med Pipeline, from Israel, through Cyprus, through Greece, to Europe, something that will benefit our economies greatly, provide stability for the region and prosperity to our peoples; but also, we think would diversify the energy supplies to Europe,” he continued. “The fact that we are joined in this meeting by the US Secretary of State, Mike Pompeo is significant. It signifies the fact that the United States supports this regional effort, and it has many, many facets that we’re going to discuss. And I think that it says that this is something for the long haul. Obviously, we would welcome the association not only of the United States, but other countries, something that we’re going to discuss as soon as we complete the open part of this meeting," noted Netanyahu. Also attending the meeting were Transportation Minister and Acting Foreign Minister Yisrael Katz, Energy Minister Dr. Yuval Steinitz, Cyprus Foreign Minister Nikos Christodoulides, Cyprus Energy, Commerce, Industry and Tourism Minister Georgios Lakkotrypis, Greek Foreign Minister Georgios Katrougalos, Greek Environment and Energy Minister Giorgos Stathkis, US Ambassador to Israel David Fredman, Cyprus Ambassador to Israel Thessalia Salina Shambo, Greek Ambassador to Israel Elias Eliadis, Israeli Ambassador to Cyprus Sammy Revel and Israeli Ambassador to Greece Irit Ben-Abba.